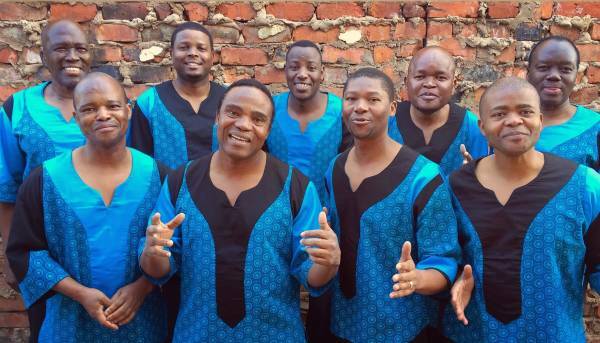 Ladymith Black Mambazo, with Albert Mazibuko top left. Photo supplied. It was news that came from nowhere. Ladysmith Black Mambazo were on tour when they heard that someone from New York wished to meet their leader, Joseph Shabalala. That someone turned out to be Paul Simon, who, to their complete amazement, wanted to work with them. At the time, after all, the all-male a capella ensemble had virtually no profile outside South Africa. “He made such different music to us, and we didn’t know anything about singing pop music,” recalls Albert Mazibuko, who since Shabalala’s 2014 retirement has become the group’s longest-serving member (a mere 49 years). Simon sent them a cassette of Homeless, accompanying himself on piano, with a note saying it was based on one of their recordings. Ladysmith in action. Photo supplied. 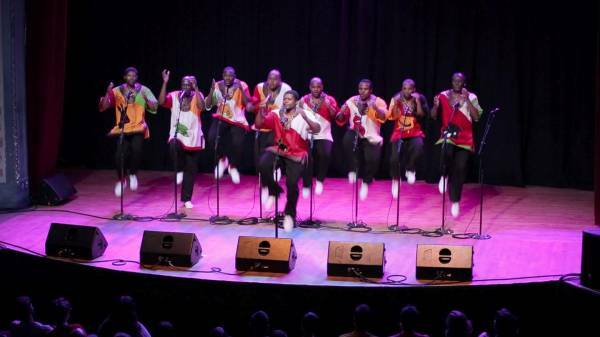 World touring and any many collaborations ensued, but the group’s association that will be etched deepest into history was with Nelson Mandela, who was inspired by their music during his 27 years of imprisonment. He invited them to sing at his 1993 Nobel Peace Prize reception, again at his 1994 inauguration as President, and later named them South Africa’s cultural ambassadors.